1. Please select each color, size, and quantity required per style, add to cart. Ordering a mix of sizes and/or colors? Choose the "mix and match" options. 2. You will be charged shipping for the entire order and not per order. 3. Once you proceed to checkout and if you select the "Custom Plus Size" option from the drop-down menu, please specify bust, waist and hips measurements and for "Kids/Jr" option, specify age. 4. Also, include your need by date in the notes to seller section at checkout along with any additional comments. 🌹 A soft matte crepe robe perfect for lounging and modeling alike! 🌹White bridal robe is lined for free! 🌹The fabric is soft to the touch and lightweight. 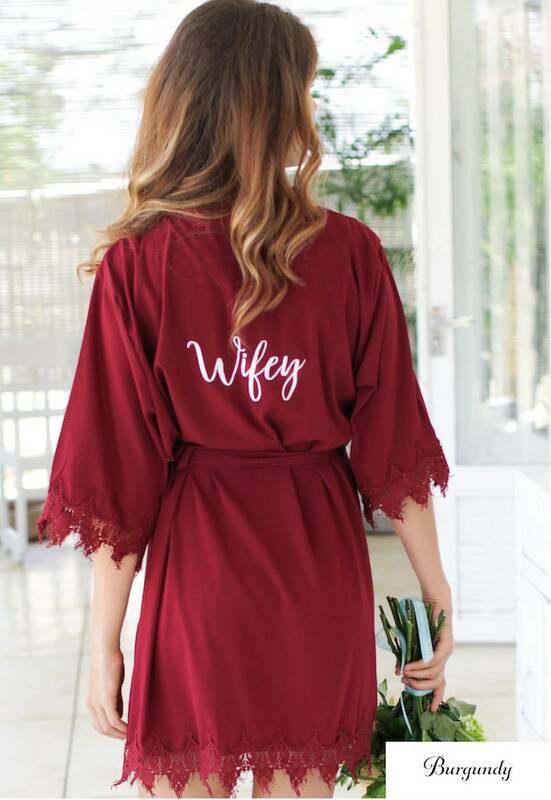 🌹The lace pattern strays away from some of the more rigid lace patterns and winds its way through the robe giving the appearance of a wavy hem and has delicate threads hang at the ends for a breezy, soft and sophisticated look. We make all of our robes by hand so the robes can come in all sorts of sizes and colors! We hand dye all of our laces to match the color of the robe with a slight contrast. XS/S fits sizes US 0-6, length from highest shoulder point to robe's bottom- 34"
M/L fits US sizes 8-12, length from highest shoulder point to robe's bottom- 35.5"
XL fits sizes 14-16, length from highest shoulder point to robe's bottom- 36.5"
XXL fits sizes 18-20. length from highest shoulder point to robe's bottom- 37.5"
XXXL 22-24, length from highest shoulder point to robe's bottom- 38.5"
Please contact me if you have any problems with your order. Items on sale are final sale and cannot be returned for a refund. But if there are issues, they can be exchanged for a restocking fee and shipping is covered by the buyer. I can definitely rush your order and have it delivered within a week or sooner from the order date. Opps, I ordered the wrong size for myself/my bridesmaids! We understand this is a really busy time for you! If you’ve ordered the wrong size, let us know as soon as you can. We require notification of exchange within 3 days of delivery. The item(s) must be returned to us within 7 days of initiating the exchange. Please message us on Etsy to let us know your return is on its way with a photo of the postage receipt with a tracking number. Any customized, printed, or embroidered items including sashes and robes are final and can not be returned or exchanged. *All sale items purchased are final and cannot be returned for change of mind. Do you refund for damaged/lost items in transit? We’re happy to replace your damaged order to ensure everything is perfect for you :) Your satisfaction is my team's top priority! Simply message us on Etsy to get the process started. When placing your order don't forget to double check all shipping address details are correct and up to date. I changed my mind about my order or found something elsewhere. Can I get a refund? We are happy to accept the return of your order for store credit, provided your items are returned in their original packaging within 7 days, folded neatly and unworn. Our items are delicate so please choose wisely, and if you need a hand deciding, we’re only too happy to help. If your order is still processing and has not been shipped yet, please message us on Etsy to cancel within 2 days of ordering. I didn’t receive my pre-order item when I was supposed to. Can I get a refund? We understand that you need your items in a timely manner. We’ll refund any sales that don’t reach you in time that are on a pre-order basis. Does SS Weddings cover the cost of postage for returns? If your items arrived damaged or different to what’s described on our website, we’re happy to cover the cost of return postage. Message us a photocopy of your postage receipt, and we’ll reimburse you for this cost. If the order items did not arrive damaged or different and you are simply returning the items/exchanging then it is shop policy that customers are responsible for return shipping costs. We offer to customize orders in every way possible since we make all our items from scratch, just message us to discuss your custom order! Hand wash and hang or lay flat to dry!